Kuala Lumpur, or also known as KL, is Malaysia’s national capital. It’s also the largest city in the country. KL is one of the best destinations that you can visit while in Asia. Apart from its colorful culture, religion, and shopping destinations, it also has a lot of wonderful attractions to visit and experience. In this guide, we will share with you top-notch attractions and experiences that you should visit and try in this beautiful city. We will also give you some tips and tricks on how to enjoy Kuala Lumpur, even on a budget. So, let’s start! What is KL without the famous landmark, Petronas Twin Towers? Don’t leave this city yet if you haven’t visited this 451.9 meters, 88-story twin tower. Whether you go here first thing in the morning, late in the afternoon, or even at night, this tower will still get you mesmerized. For a certain price, you can go up to the KL Tower’s Observation Deck and get to see a 360-degree view of Kuala Lumpur. Have a buffet dinner at KL Tower Revolving Restaurant. Be brave enough to have your photo taken at the Sky Box. Kuala Lumpur is more than just Petronas Twin Towers and KL Tower! Whenever you visit and get to know KL even more, I bet you’ll love this city even more. You might want to discover Kuala Lumpur on your own. Free self-guided maps, walking tour routes and suggestions are available online. All you have to do is to buy a Malaysian sim at the airport, have it inserted to your phone, and you’re good to go! You can use GPSMYCITY. Some tourists don’t like to go and explore a particular destination alone. Well, we cannot blame them. If you love to meet new people and make new friends, you can immediately go to KL City Gallery. The KL City Gallery is like a one-stop tourist center where you can have free maps, see KL dioramas, and have guided bicycle and walking tours. What’s good in here is that you are able to be with other tourists who also don’t like to explore alone. 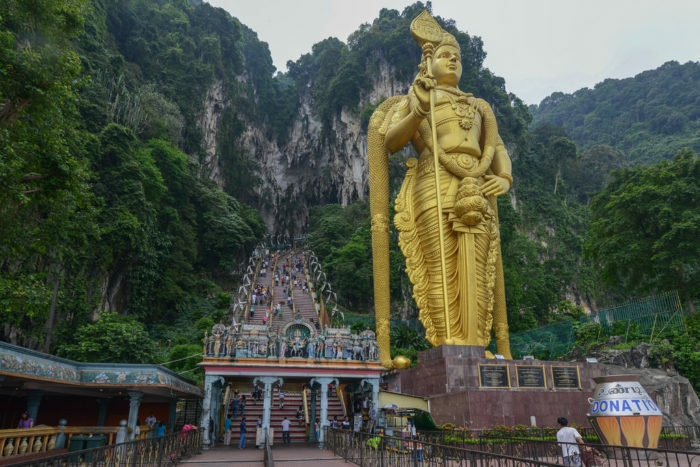 One of the most famous attractions in KL is the Batu Caves, a limestone hill Hindu shrine that’s dedicated to their Lord Murugan. Before you go here, make sure you condition yourself to climb a 272-step steep stairs. Be careful with the monkeys here because they easily grab things placed in a plastic cellophane and/or paper bags. Sky Bar – We placed this on top of the list as this bar is also considered to be one of the best spots to view the Twin Towers. Heli Lounge Bar – One of the best places for you to have a good glimpse of the KL Tower. * Go to Bukit Bintang. There are a ton of great bars there! Tip: If you plan to shop a lot and want to stay near shopping malls, the best area to get an accommodation is around Bukit Bintang. The best time to visit KL is during the months of May to July, as these months are when the weather is settled, little to no rains at all. The temperature may be somewhat steamy, so make sure to keep hydrated and wear light-material clothing. Food tells us a lot about a country’s culture and everything beyond just culture. One way to get to know Kuala Lumpur better is to try to eat their local dishes. Malaysian dishes are generally spicy. Chili pan mee – a Chinese-Malaysian noodle dish that’s full of textures and flavors your taste buds may want. Main ingredients are fried anchovy, onions, scallions, peanuts, shredded pork, and poached egg. Make it more delicious by adding chili. 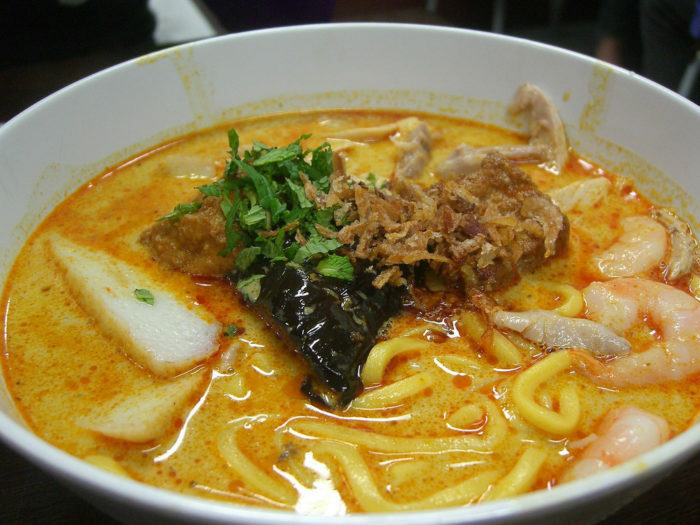 Curry laksa – also a noodle soup, but the base is coconut. Basic ingredients are your choice of noodles (egg noodles, flat rice noodles, or vermicelli), Hainan-style chicken, tofu puffs, cockles, bean sprouts, and green beans. It is seasoned with fresh lemon and chili sauce. Char Kuey Teow – this is a Malaysian version of the famous beef fried noodles. Best place to eat these kinds of foods? Try Jalan Alor. It’s pretty much easy to travel around KL. They have trains and monorail which makes it even easier. All you have to have is a map, to show MRT/LRT lines. All their staffs in there, as well as their locals, are very much helpful to show you which lines to take and how to get a card or token. Cabs and car rental services are also available in Kuala Lumpur. As for cabs, they have metered ones and others are run by a fixed price (but mostly they go for a fixed price). If you opt to travel by cab, download Grab app and use it to book a cab for you. This is cheaper and more convenient rather than hailing. Generally speaking, Kuala Lumpur is a safe city. But still, take a ton of extra care. Always keep an eye on your belongings, most especially when you are in the airport. 1. You should really get a Malaysian sim. This will help you in so many ways! Probably this is the first thing that you should do after getting your bag from the conveyor and having yourself checked by a customs officer. 2. As much as possible, do not take a cab in KL as they charge you with a fixed price (usually higher than by meter). Yes, you can still get a taxi that would agree to turn on its meter, but it might take longer to find them. Best advice, book a taxi via Grab. It’s usually cheaper and easier. 3. Jalan Alor is your best friend if you’re a type of person who loves food. 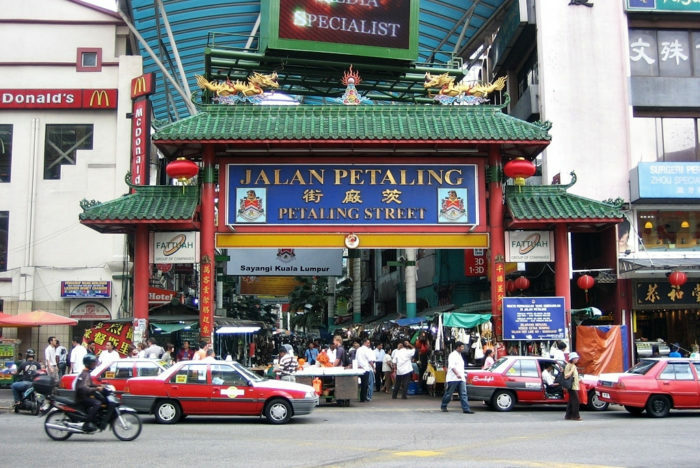 Jalan Alor is the biggest food street in KL. All kinds of dishes and cuisines, you can find it in there. 4. In case you have days where you don’t have a planned itinerary, go for a side trip. Suggestions are: Genting Highlands, Melaka, Putrajaya, and Georgetown. 6. Malaysian people are generally friendly. You’ll be amazed! Don’t get intimidated or scared if they can understand you because certainly, they can. Just be patient enough if they may have a hard time grasping their thoughts and finally putting them into words. 7. Prepare your haggling skills. Never settle for a fixed price.